ABOUT THIS PRESS CONFERENCE & INTERVIEW: On September 11th 1964, the Beatles traveled from Montreal to southern Florida on a flight that had been put off until the last moment due to Hurricane Dora off of Florida's North Atlantic Coast. 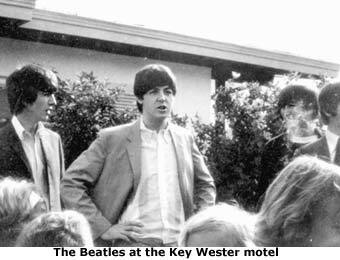 Due to the threat of high winds and unpredictable weather, the flight was detoured to Key West, where the Beatles were photographed at the Key Wester motel. According to Beatles' author Mark Lewisohn, with civil rights being a heated issue in America in 1964, the Beatles had refused to perform at the Gator Bowl until they were assured that the audience would not be segregated by race at the concert. It is apparant though that there were similar issues with the hotel that were unable to be resolved. In the end, the Beatles chose to stay elsewhere. Q: "Why did you cancel your hotel reservations in Jacksonville?" JOHN: "We didn't even book 'em, you know. We don't do the booking or cancelling. Must be some reason why we're going on. We're trying to catch the hurricane." 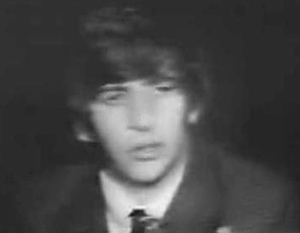 In the final moments just before showtime at the Gator Bowl, eating a quick meal as the press asked questions, Ringo mentions the situation with their rooms, stating, "We usually eat in the room, but seeing the hotel's got no room for us, we have to eat here." John then adds, "That was unfortunate, that." Ringo repeats the word "unfortunate" for added emphasis. In the short clip that survives of the Jacksonville press conference, the Beatles are asked a couple of lightweight questions about nicknames, and also about the Rolling Stones. 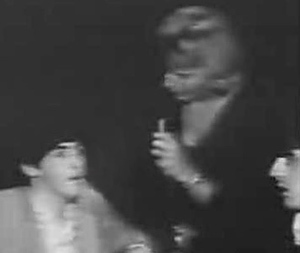 The Beatles also had the opportunity for a brief one-on-one interview with reporter Jean Morris. Morris sounds somewhat confused, and therefore gets the full treatment from the Fab Four. Q: "Do you have any nicknames among yourselves?" JOHN: "Well, I call George, Ray Coleman." GEORGE: "I call Ringo, Dave. But apart from that we don't." PAUL: "We're lying, of course." Q: "Are you concerned about the rumor that's going around that the Rolling Stones are more important than the Beatles?" JOHN: "Is it worrying us? No." PAUL: "It doesn't worry us, 'cuz you get..."
JOHN: "We manage our grief." 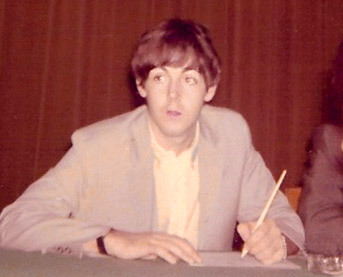 PAUL: (giggles) "You get these rumors every so often, you know. I mean..."
PAUL: "Dave Clark was bigger than us a couple of months ago. It doesn't always have to mean an awful lot." GEORGE: "Every two months we hear of 'em taking over." JEAN MORRIS: "Paul, you're the only unmarried Beatle, or are you the only married Beatle?" PAUL: "You've got it mixed up, Jean. John's the only married one. All the rest of us are unmarried and single and free, and everything." JOHN: "You can get him on H.P." JEAN: (to George) "Hi. You're not married." GEORGE: "No, I'm George. Haaaaaaaaaa." JEAN: "Did you write (This Boy Instrumental) 'Ringo's Theme'? JOHN: "Where have you been, Jean?" JEAN: "No, I think it's BEAUTIFUL." GEORGE: "You haven't been reading the little bits of paper, have you. It SAYS who writes Ringo's Theme and..."
PAUL: "Actually, it was John and I who wrote Ringo's Theme." JEAN: "It's a BEAUTIFUL piece." PAUL: "Thank you. Thank you, Jean." JEAN: (to John) "And you're the married one, right?" JOHN: (full-out laughing) "That's me, Jean." JEAN: "What does your wife think about your traveling away all the time?" JOHN: (comically) "Well, she don't like it, Jean, much. But she doesn't mind too much because it makes a lot of money for her, eh, Jean?" JEAN: "Why don't you come to Tampa and see US sometime?" JOHN: "Oh, I thought you said something else. Well, we'd LOVE to. We'd love to do that, Jean. Maybe we will one day." JEAN: "We'll be looking for you." 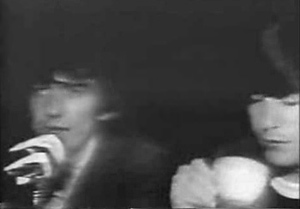 GEORGE: (moving her along) "Great, there's Ringo!" JEAN: "Well, Hi Ringo. Where are your drums?" RINGO: "Probably at the place we're gonna play tonight, Whatever it's called." JEAN: "Do you always eat on the run like this?" RINGO: "No, we sit down like this." JEAN: "No, I mean, with all these people don't you get indigestion?" RINGO: "Well, we usually eat in the room, but seeing the hotel's got no room for us, we have to eat here, you see." JOHN: "That was unfortunate, that." JEAN: "Do all of the teenagers outside, in the mobs that you have, that are always around... Do they bother you?" RINGO: "No, never. Not yet. They may do when I get old, but I'm pretty young yet." JEAN: (laughing) "Thank you very much." JOHN AND PAUL: "Thank you, Jean."